Manufacturing woollen textiles since 1783, AW Hainsworth & Sons are not only one of the oldest companies in Yorkshire but also in Great Britain. Situated in Farsley, they have been market leaders in British textiles for over 230 years. The seventh generation of the family owned company continue to integrate the traditional qualities of craftsmanship with design, cutting edge innovation and product development to meet the needs of a growing and diverse global customer base. Their fabrics are seen adorning the Queen’s Royal guard at Buckingham Palace, gracing catwalks worldwide with their stylish elegance, enriching the furnishings of palaces and protecting emergency services from the damaging effects of fire. For a number of years the Yorkshire Society have been installing plaques to commemorate Yorkshire men and women who, during their life, gave exceptional service or contributed significantly to not only the county but the entire nation. Recently, they have teamed up with MTL of Rotherham who will produce Yorkshire made stainless steel plaques on the buildings of companies founded and still operating in Yorkshire. Today, the Yorkshire Society unveiled their first plaque to commemorate AW Hainsworth’s Yorkshire heritage and their contribution to the Yorkshire community. 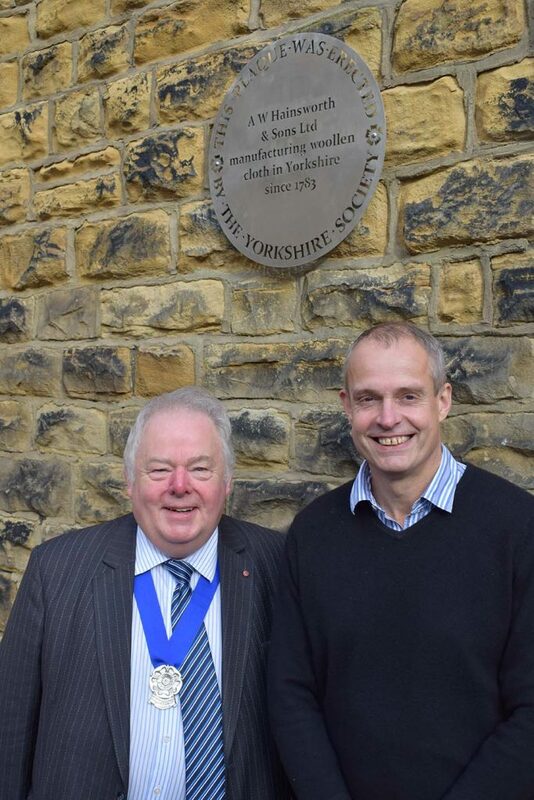 Keith Madeley, Chairman of the Yorkshire Society explains how pleased he is that such an established company in Yorkshire have been chosen as the recipients of the first of many to receive a Yorkshire Society Corporate Plaque. Employing over 180 people in Leeds, this woollen mill is the cornerstone of the local community. Their ethos for investing in people and maintaining strong partnerships with customers and suppliers have driven their commitment to maintaining the Hainsworth name as the benchmark in all textile manufacturing.